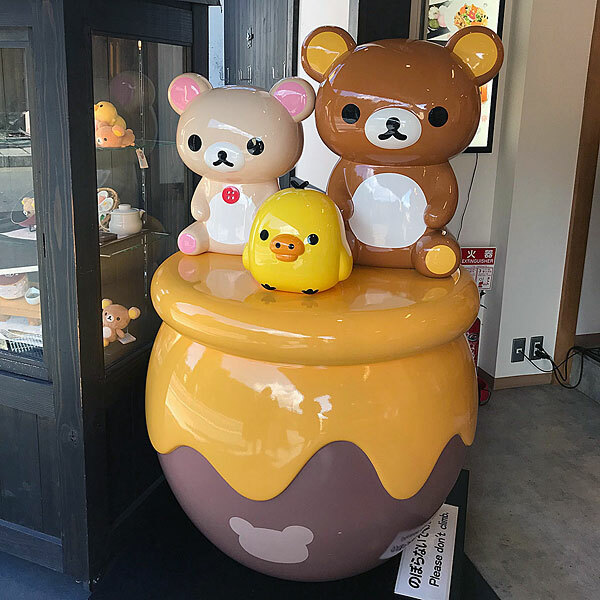 Visiting The Rilakkuma Cafe & Shop in Japan - Super Cute Kawaii!! 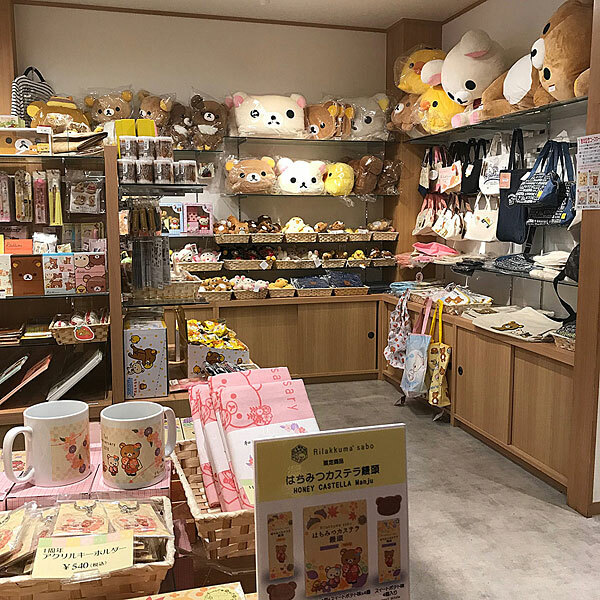 Continuing our posts about cute places we’ve visited in Japan, here’s another adorable character cafe & shop, Rilakkuma Sabo in Arashiyama, Kyoto. 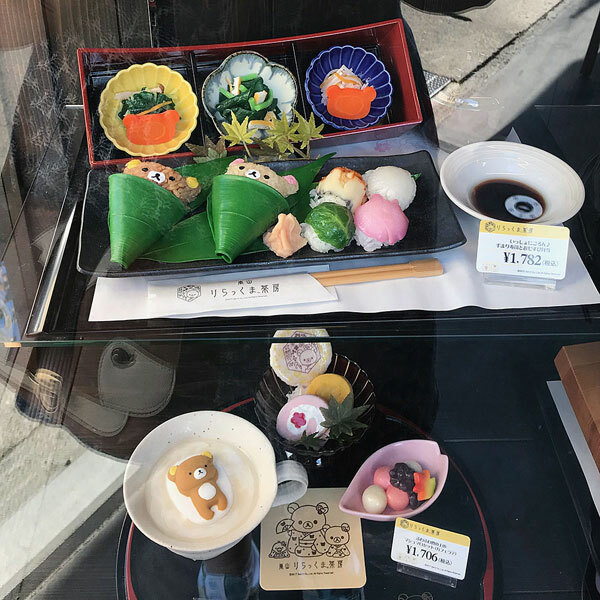 I first visited Arashiyama in 2016 and would never have predicted that 2 years later it would have unique character cafes/shops dedicated to Rilakkuma and Miffy! It does make sense as Arashiyama is quite a touristy place with the famous bamboo grove and Togetsukyo Bridge plus hundreds of temples and gardens and monkey park. 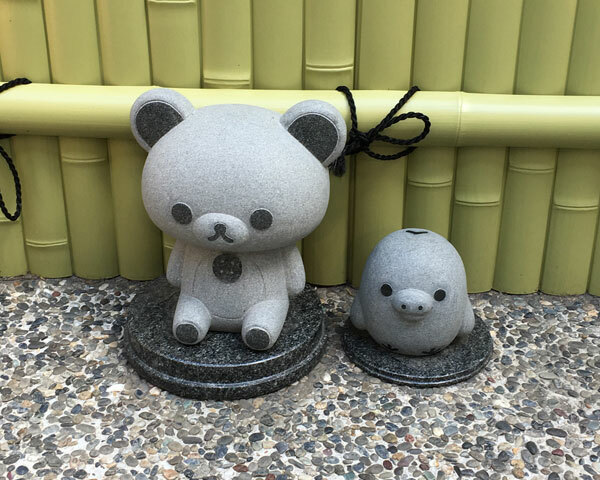 It’s a lovely place to wander around and the Rilakkuma cafe & shop blends in beautifully. You need to keep an eye out for the kawaii banners or you might walk right past! The cafe has no reservations – instead you take a ticket with a number and time and go upstairs to be seated when your number displays on the screen. We arrived not long after opening on a weekday and only had to wait about 20 minutes. If you arrive later or come on a weekend/holiday there may be no reservations left or only for much later in the day. It looks like they can now text you when your table’s ready so you can go and do other things. There’s plenty to keep you entertained though with character figures to take photos with, a menu to look through and plastic food displays. 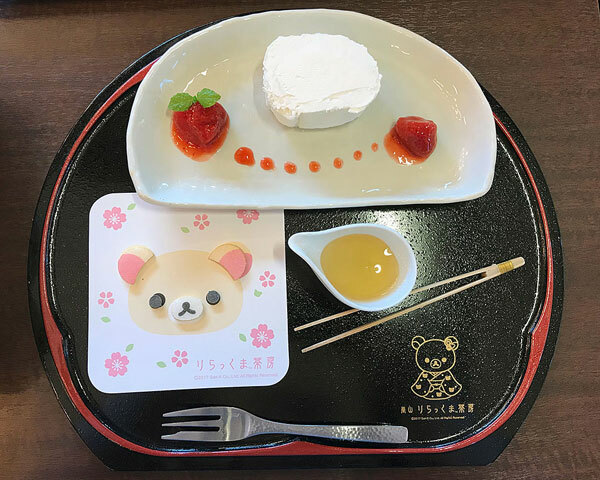 The cafe is much healthier than most character cafes with seasonal fruit and vegetables, cute takes on traditional meals and lots of Rilakkuma’s favourite honey. You can view the current menu online. 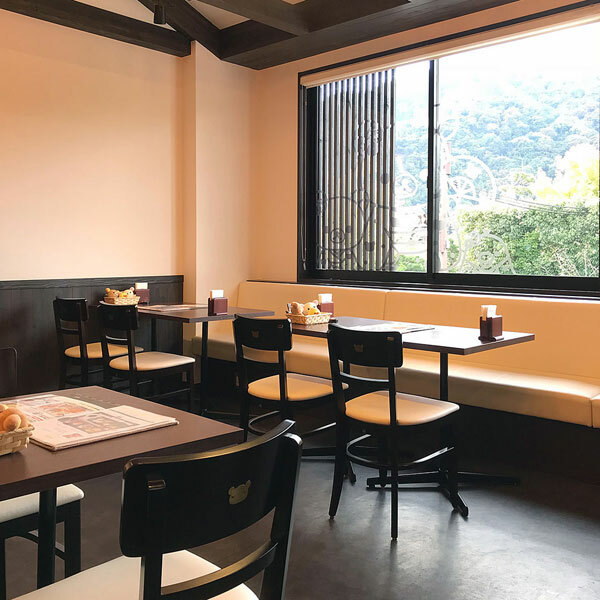 The actual cafe is quite small and isn’t super kawaii, instead going for a subtly cute traditional style. Spot the Rilakkumas in the chairs and window! There are also Rilakkuma plushies on the tables to take photos with. 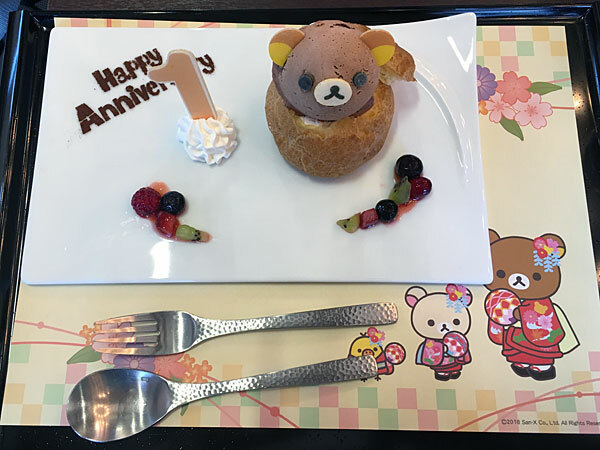 Rilakkuma Sabo was celebrating its 1st anniversary when we visited so there were some special dishes on the menu. 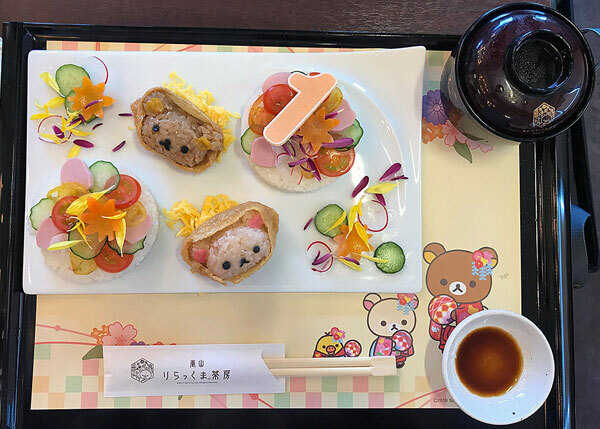 I chose this pretty sushi plate with Rilakkuma & Korilakkuma rice heads inside tofu pouches and some more rice topped with salad, plus miso soup. It was a little bit samey but so fresh and healthy compared to most character cafes. This visit was my birthday present for Nicolette as I knew she would be able to get a proper meal here as they use so many vegetables. 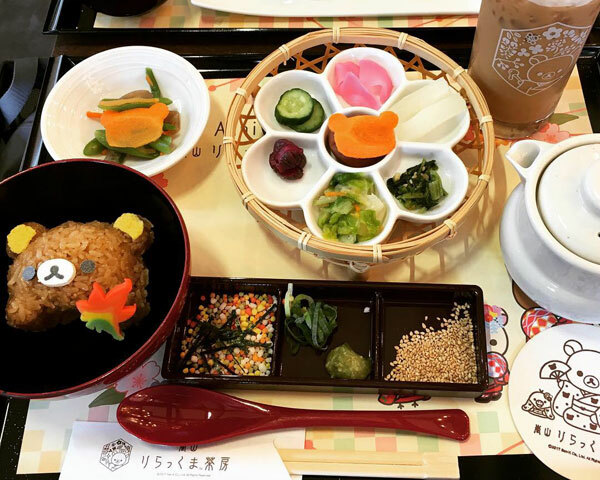 This is an ochazuke set with various vegetables, pickles and furikake sprinkles. Almost everything was vegetarian – and possibly vegan too – plus anything fishy was separated so could be avoided. 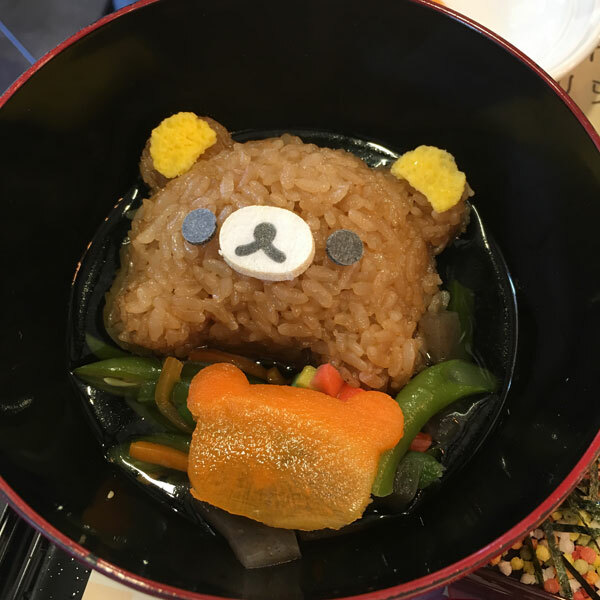 You add toppings to your adorable Rilakkuma rice and then pour over tea. I love the little pieces of egg for ears – the face is rice paper. 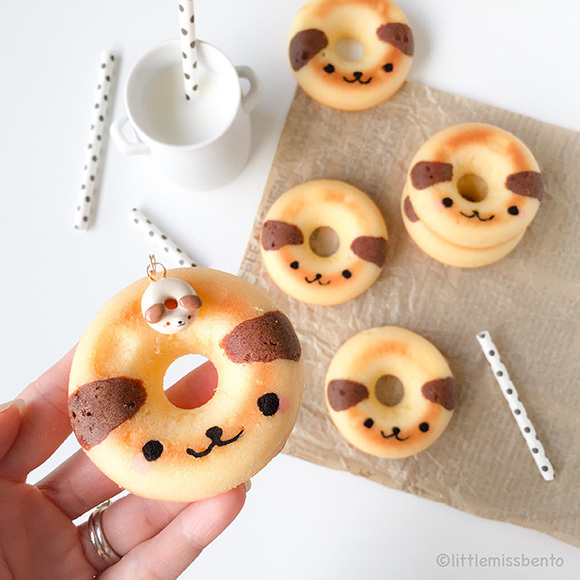 For dessert, Nicolette picked her fave Kogumachan as an ice cream puff. 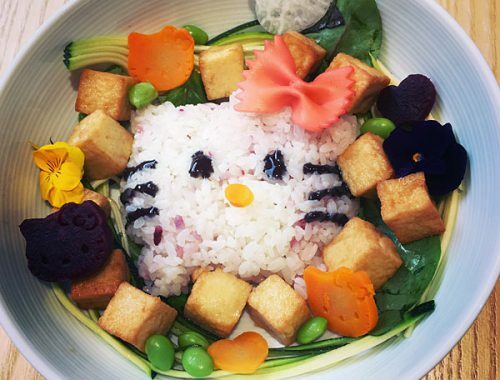 It really was almost too cute to eat. 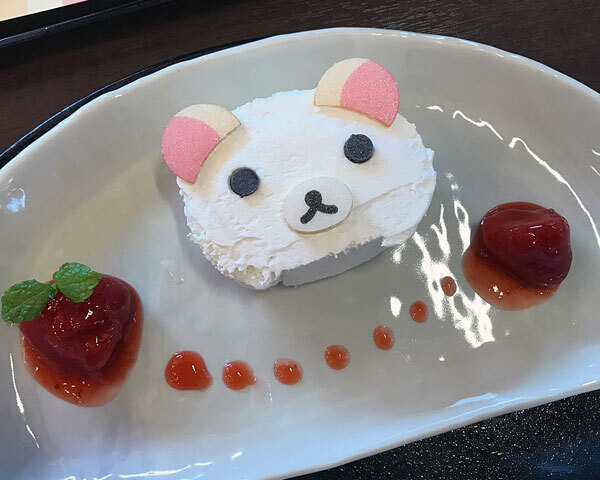 I went for an interactive dish – Korilakkuma roll cake that you decorate yourself! This is such a fun idea, though trickier than it looks. Nicolette was videoing me so I rushed it and messed up the placement a bit but it was still super cute and really good – light and not too sweet. It also came with honey but I didn’t think it needed it. When I went to pay, I was given a special anniversary gift bag with a coaster and pack of paper napkins. 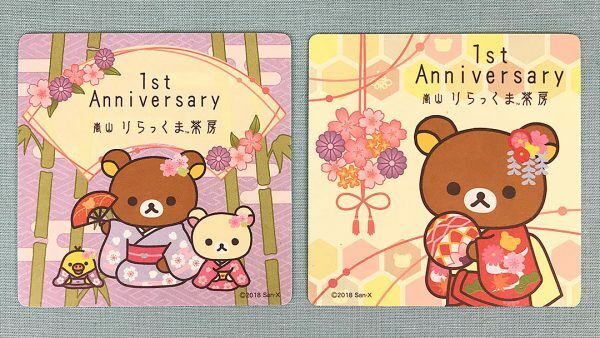 We also got to choose another coaster each for spending lots of money in the shop! 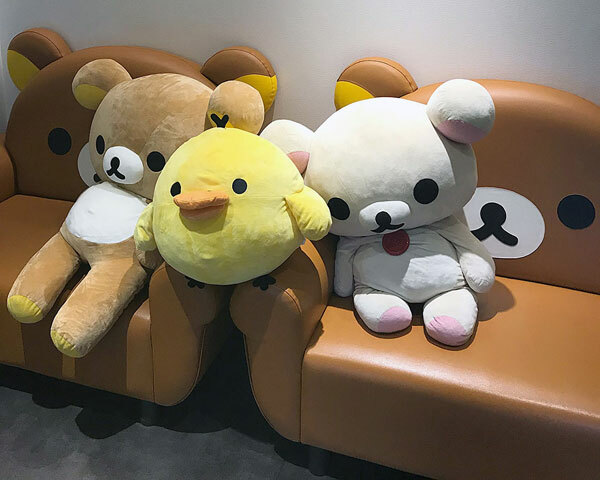 One of my favourite parts of the visit was getting to hang out with these giant plushies on the famous Rilakkuma sofas. They’re perfectly set up for selfies and I really want one in my house now. And there was still the shop to explore! 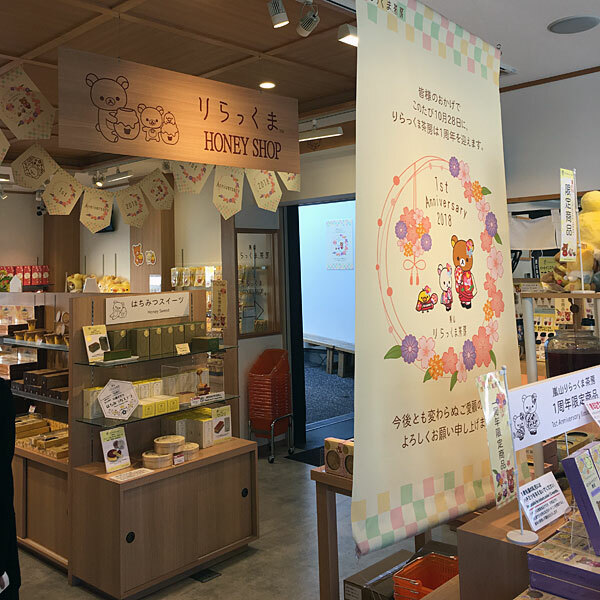 It’s split into two parts – this is the Honey Shop, which sells exclusive Rilakkuma food products with a honey theme. There are biscuits, cakes, candy, popcorn, pudding and a whole range of honey and honey syrup in different flavours. The other area is for character goods and has all the usual products plus exclusive designs. We spent quite a lot of time and money here and could easily have bought more but it was the first day of our trip so we had to pace ourselves. 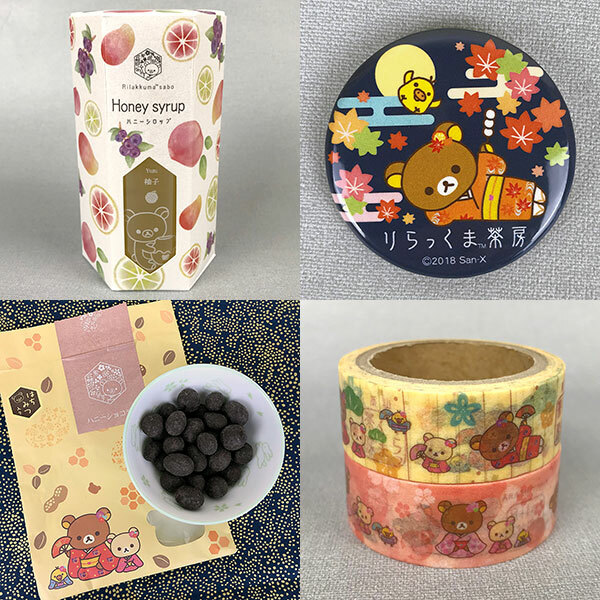 Yuzu honey syrup, honey chocolate beans and exclusive badge and washi tape. 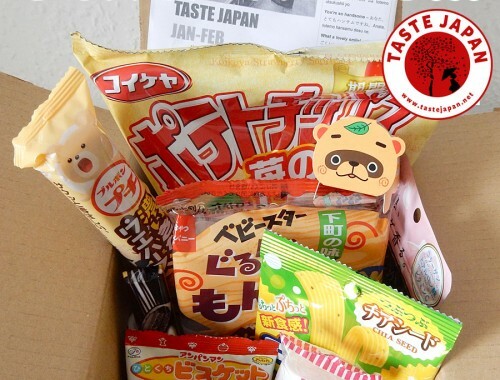 We got some great gifts and souvenirs here and I will write more about the edible items in another post. 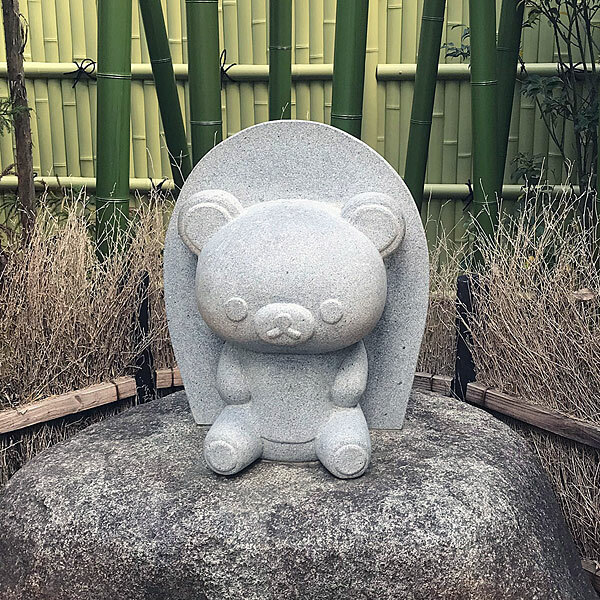 Don’t miss the little courtyard at the back where there’s some outdoor seating and the most kawaii stone statues. There’s also a takeaway stand at the front of the shop where you can buy ice cream, honey fries and drinks. 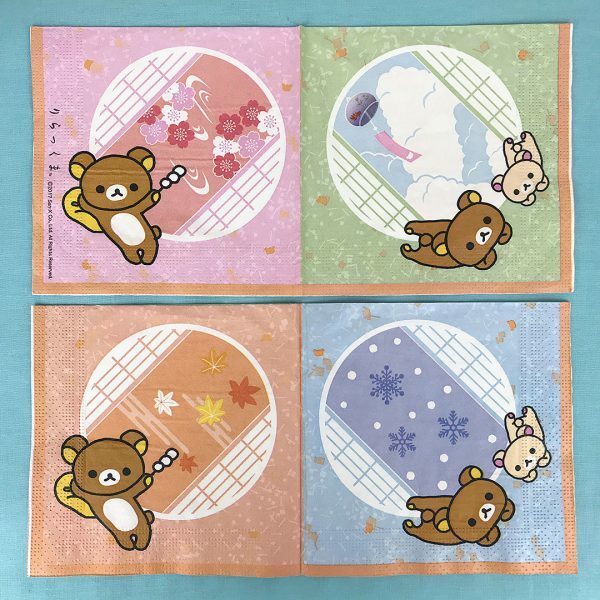 Rilakkuma Sabo is in Arashiyama – the easiest way to get there is to take the train from Kyoto station to Sagaarashiyama on the JR Sagano Line. Then it’s a short walk to the main shopping street on the way to the Togetsukyo bridge. Here it is on Google Maps and here’s my 2016 guide to Arashiyama for more things to do. It’s a permanent cafe and shop open 7 days a week. There are no cafe reservations available so try to arrive early to get a spot. 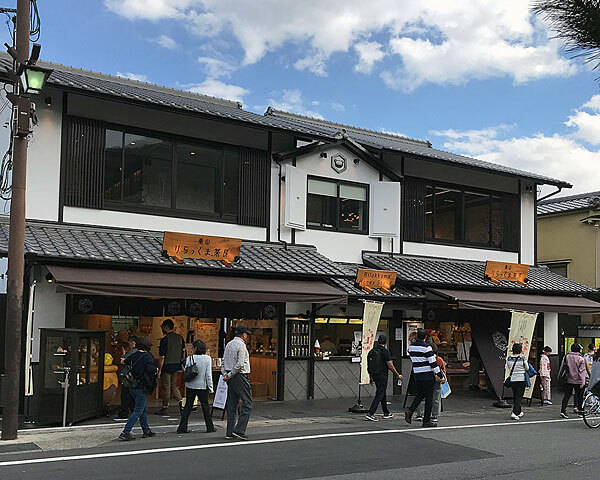 There’s also a new branch opening on the island of Miyajima near Hiroshima. Miyajima is one of the most beautiful places I’ve ever visited so I’m very glad to have another reason to go back. Here’s a blog post I wrote about my visit there.